Two years later, Nazi Party leader Adolf Hitler became chancellor of Germany and quickly turned the nation's fragile democracy into a one-party dictatorship. Police rounded up thousands of political opponents, detaining them without trial in concentration camps. The Nazi regime also put into practice racial policies that aimed to "purify" and strengthen the Germanic "Aryan" population. A relentless campaign began to exclude Germany’s one-half million Jews from all aspects of German life. Chancellor Adolf Hitler was the leader of the National Socialist German Worker’s Party -- the Nazi Party. Many Germans hoped Hitler would bring order to a nation plagued by economic depression, social unrest, and political instability. 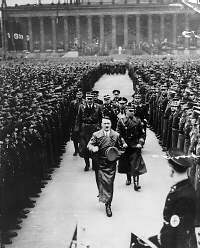 Hitler’s brand of fascism combined several elements: extreme nationalism, militarism, racism, and antisemitism.